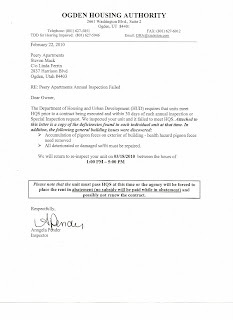 HUD conducts a Housing Quality Standards (HQS) inspection of the building, prior to renewing the housing assistance payments contract for the following year. If the building does not pass the HQS inspection, my contract with HUD would be terminated. Leery of their claims, I asked Kier to send me a list of these repairs. 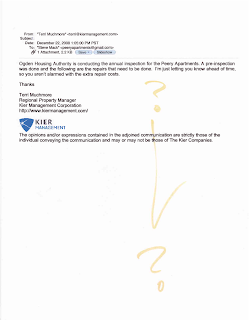 The list that I received from Kier, was substantial and contained a significant number of tenant caused damages. 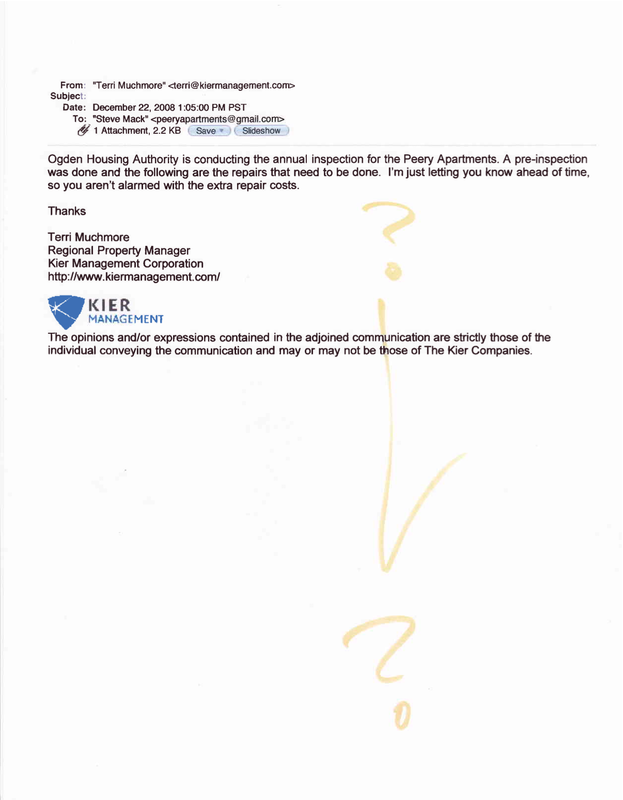 According to Kier's lists, NOT ONE of the 14 units in the building, was operating at or above HUD minimum standards, on Dec. 22, 2008 and January 14, 2009. 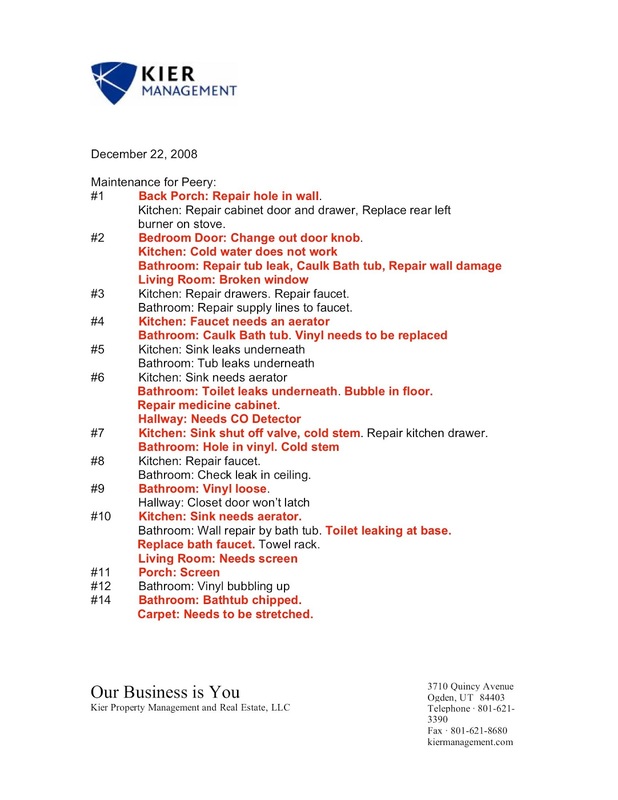 The two lists of repairs that Kier sent to me, are the ones you see above, and at left. Kier refused to make these repairs unless I pre-paid for them..... I did not. Yet somehow, the building miraculously passed the re-inspection and the HUD contract was renewed in 2009. 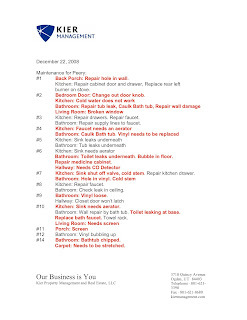 Soon after taking over the building form Kier on December 1, 2009, I discovered that almost none of the repairs noted on Kier's lists from 2008, had ever been fixed! According to HUD rules and regulations: If a property fails to meet HUD-Housing Quality Standards, the property owner is afforded time (usually 30-days) to effect the needed repairs, or risk the reduction or cancellation of the subsidy contract. 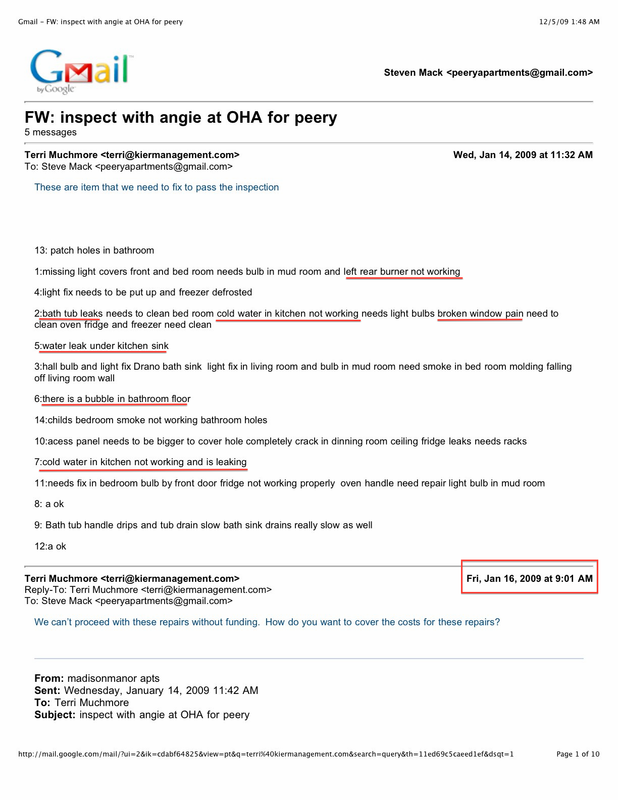 The HUD inspector arrived on February 18, 2010 and after a very thorough inspection, she promptly failed the building, citing among other deficiencies, every single item that appears in red, on the lists of repairs that Kier had sent me (above). The only difference? ... I manage the building now... NOT Kier. Data from the 2010 / 2011 inspection confirms that Kier never made any of the repairs that were cited in the 2009 / 2010 inspection. (The items in red on the lists above). Miraculously, just weeks after failing the inspection, the building passed the re-inspection and the contract was renewed for 2010/2011. 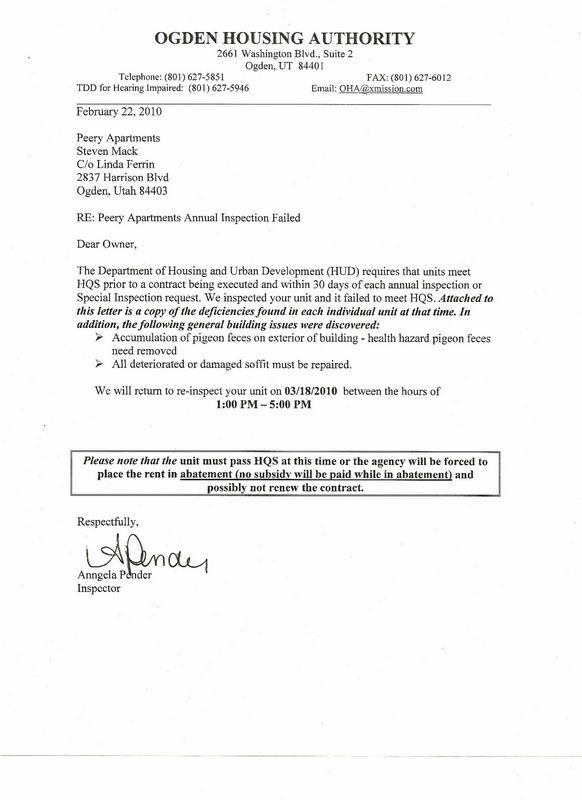 During the 2010 / 2011 inspection, not only were the same items cited again by the same HUD inspector, she also cited me for the enormous amount of pigeon droppings that had been accumulating on every horizontal surface of the building since I hired Kier. I was also cited for the presence of dry-rot along some of the eaves. Dry-rot that was caused by Kier's failure to remove those pigeon droppings, even though Kier charged me for doing the work, several times per year. Kier was never cited by HUD inspectors, for the dry-rot along the eaves of the building, that I discovered was caused by their failure to do any preventative maintenance at the building, as required by paragraph 10 of our contract...!!! 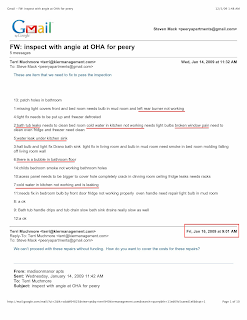 On December 1, 2009, I began to self manage the building and was immediately cited by OHA/HUD inspector, Angela Pender for everything that HUD looked the other way for with Kier, for the previous 4 years, including the unit deficiencies that Kier had been cited for and had allegedly made in 2009, but never did. AND THE VERY BEST PART...??? 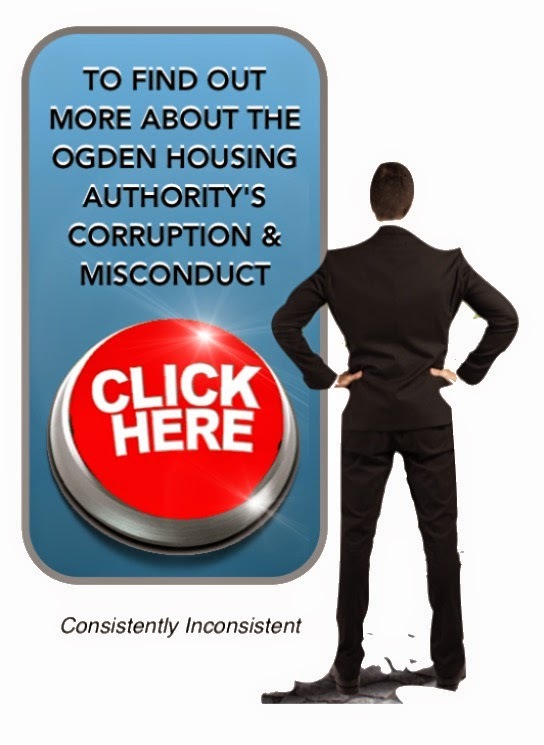 Between 2005 and 2009, HUD and their inspectors routinely looked the other way and repeatedly renewed this subsidy contract, while allowing Kier to maintain the building in the filthy, dangerous, and deplorable conditions that have been so clearly documented in the pages of this Blog. 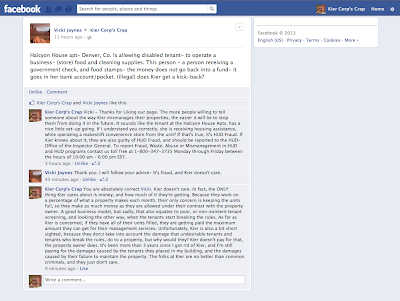 Evidently, Kier has no problem letting their tenants in Denver, commit HUD Fraud. They don't even have a problem with knowing about it and allowing to continue...but why would they? HUD thinks the folks at Kier are heroes, and well above doing anything so unethical. 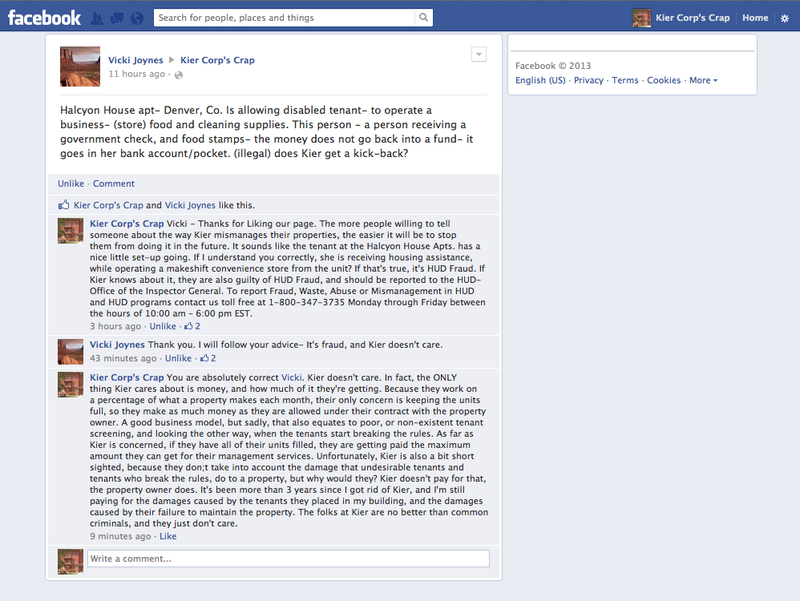 I received the message below on my "Kier Corp's Crap" Facebook Page about one of Kier's tenants in Denver, Colorado, who is receiving housing assistance AND food stamps, while allegedly operating a makeshift convenience store out of her apartment. It's not the first time I've heard reports about this person. Reportedly, Kier knows about it also. Click on the image to see it full size. 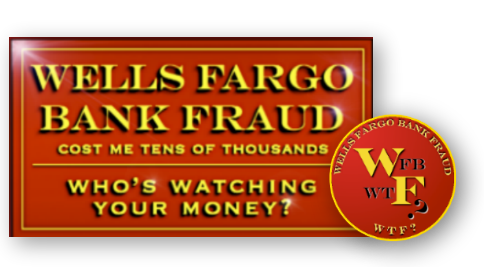 CAN YOU SAY HUD FRAUD?